Successfully Added 3G Android Tablet - Android 7.0, Quad-Core CPU, Dual-IMEI, 7-Inch Display, 2200mAh, WiFi, 2MP Camera, Bluetooth to your Shopping Cart. This 3G tablet is the perfect gizmo for those of you that are looking for a cheap Android tablet that brings along great connectivity. 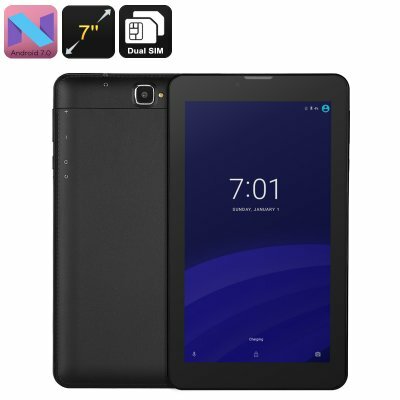 With its Dual-SIM card slots and two IMEI numbers, this Android tablet PC allows you to connect to two mobile network providers at the same time. Thanks to this, you’ll be able to browse the web no matter where you’re at. This brings along great efficiency as, with this 3G tablet at your side, you’ll always be able to stay connected to friends and family. Whether you simply like to stream a movie, download an App, or talk to loved ones online – it’s all possible with this affordable 3G Android tablet. Packed within the body of this tablet PC, you’ll find a Quad-Core processor that reaches clock speeds up to 1.3GHz. Along with that comes 1GB RAM and 8GB internal memory. For those of you that are in the need of more storage, the Android tablet features a 16GB SD card slot. It provides you with access to the Play Store, meaning that you can easily download your favorite Apps and media on the go. With its 2200mAh battery, it will get you through numerous hours of usage time – ensuring that you’ll stay entertained throughout the day. All your favorite films and games can be enjoyed smoothly on the Tablet’s 7-Inch HD display. The tablet itself comes with an Android 7.0 operating system that supports the usage of all the latest software files available. Whether it’s Apps, games, of films – there is nothing this Android tablet PC won’t handle. With this cool gizmo at your side, you’ll always be able to browse the web and keep yourself entertained. From now on, you’ll never have to experience a moment of boredom again.